The Sustainable Development Impact Summit: outcomes and solutions. The US tops Germany and Japan. The world’s most competitive economies. How to close the renewable energy investment gap? Blockchain. The next global health crisis. The rising impact of dementia. How to teach your children to persist? Struggle in front of them. Destressing the earth. Making the Fourth Industrial Revolution sustainable. The $3 trillion global data economy. Data is the “new oil”. Want to know how your country stacks up on institutions, infrastructure, innovation and nine other pillars? 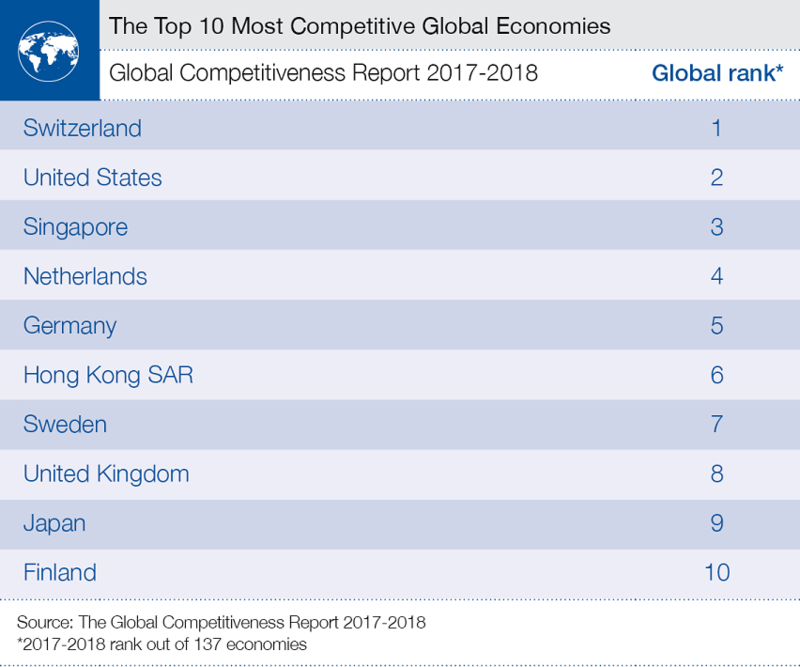 The Global Competitiveness Report 2017-2018, which contains the Global Competitiveness Index, offers data and explanations to better understand the main drivers of growth. Information asymmetry’s rising danger. Your data empowers third parties. School’s out for social mobility. Local job markets are what pushes people up the ladder. Forget social class. Forget economic indicators. Values matter. And they help explain populism and authoritarianism. Who venture capitalists ignore: mothers and babies. The true history of the Neanderthals. Not stupid, just isolated.